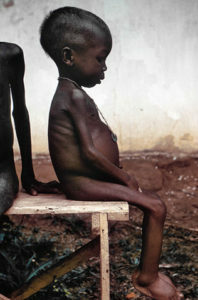 One of the most common reasons for the death of almost 300,000 children per year is malnutrition. It is seen more frequently among children who are younger than five years and reside in the developing countries. The number contributes to half of the total deaths in the child age groups across the world. 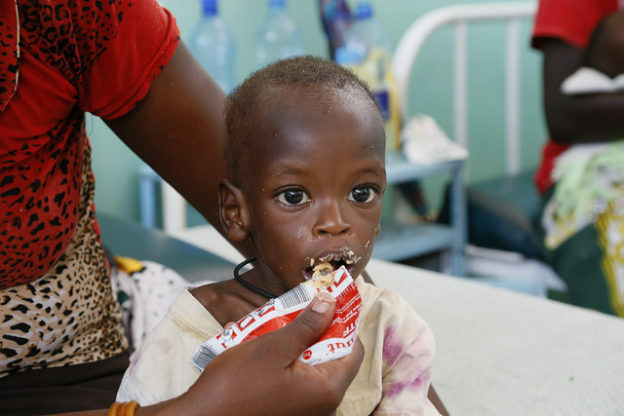 Protein-energy malnutrition (PEM) is a type of malnutrition commonly seen among children aged six months to 5 years. Kwashiorkor is a debilitating and life-threatening condition caused by the lack of protein in the diet. In the case of protein sub-nutrition, the victim exhibits reduced ability towards fluid recovery; there is a lack of immunity, and lipid absorption does not take place sufficiently. Lack of proteins results in zero substantial pressure gradient and, therefore, a failure to draw fluids from tissues into the bloodstream. This leads to the pooling of fluids in the abdomen. Failure of fluid recovery by the lymphatics results in edema and belly distension, which is the typical presentation of an undernourished child. Edema caused as a result may trick the parents into thinking that the child is well nutritioned despite the lack of protein intake. Weight loss: there is decreased muscle mass in arms and legs. Swollen abdomen: this is due to fatty liver and increased capillary permeability resulting in ascites. Peripheral edema: results from decreased oncotic pressure. A desquamative rash is seen on the flexures and the buttocks. Behavioral changes such as irritability. Victims are apathetic and miserable. Physicians believe that return of a smile is the first sign of response to treatment. Edema: Initially, it involves the dorsum of the feet and ankles and later spreads upwards to involve the whole body. Edema accounts for 5 – 20% of the body weight. Loss of fluid can mark a striking change in appearance. Treatment options depend on the severity of the condition. In the early stages of the disease, treatment revolves around providing an adequate diet for the child, with more calories and protein. However, this will not compensate for the damage that has already been done to the growth and height potential of the victim. Carbohydrates, in the form of simple sugars and fats, are given first to cater for the catabolic needs. This is because the protein catabolism includes the urea cycle and this can overwhelm the already damaged liver. So, proteins are given after other sources of energy have been provided. They serve only for the anabolic purpose. Vitamins and minerals are also essential to restore the nutritional status of the patient. Food must be introduced slowly and gradually to prevent issues arising from the administration of high calories after a long period of time. Patients of kwashiorkor may develop lactose intolerance. They require supplemental enzyme lactase. Those in the later stages of the disease may present with shock. The treatment then aims to restore the blood volume and maintain blood pressure. Early treatment can produce better results. Treatment in the later stages improves the nutritional status of the child; however, it does not compensate the physical and mental damage that has already been done. It can be a life-threatening condition if not treated on time. 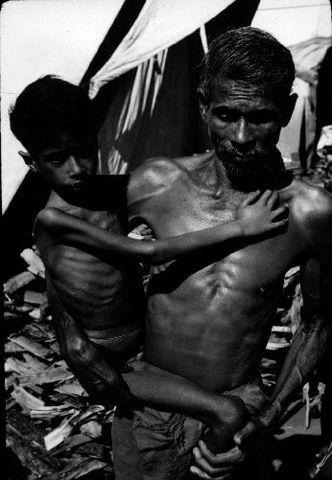 Marasmus is a type of malnutrition primarily caused by a deficiency in calories and energy. 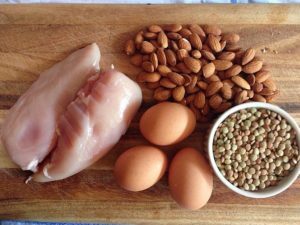 There is a severe deficiency of nearly all nutrients, especially protein, carbohydrates and lipids. An increased loss of ingested calories due to emesis, chronic diarrhea, burns, etc. Fat stores decrease up to 5% of the total body weight. Extracellular water content of the body increases. Protein mass decreases up to 30% in the case of severe muscle fibers loss striations and become thin. Protein sparing mechanisms redirect amino acids to the vital organs. Hypothermia and hypoglycemia in infants is more frequent due to underdeveloped systems. Potassium deficiency of up to 15 mEq/kg resulting in hypotonia and impaired cardiac function. Elevated levels of intracellular sodium in muscles, brain and blood cells. Metabolic adaptions in marasmus are similar to those in starvation. Basal metabolic rate decreases. The energy is diverted from muscles to the vital organs. Muscle loss is a result of decreased energy expenditure. Brain, skeleton and kidney are preserved, whereas the liver, heart, pancreas and digestive tract are first affected. Impaired glucose clearance in marasmus is due to compromised pancreatic beta cell function. Secretory functions of mucosal surfaces are impaired, decreased HCL production and slow peristalsis. Adaptations are seen by thyroid hormones, insulin and growth hormone. Thymus and all other T lymphocyte–producing tissues are affected. This leads to immunocompromised state. The brain is usually preserved during marasmus. Blood glucose: lower than 3 mmol/L values are indicative of hypoglycemia. Hemoglobin: a level lower than 40 g/L is indicative of severe anemia. Examination of blood smears by microscopy: parasite detection is indicative of infection. Albumin: It gives an idea to the prognosis. Albumin value lower than 35 g/L is indicative of severe protein synthesis impairment. Electrolytes: Hyponatremia is evident. However, results are rarely helpful and can also lead to inappropriate therapy. HIV test: not routinely performed.